…then sometime in the late 19th century, an architect called borluut wins the coveted & secluded carillonneur post. his love of flanders is fuelled by a weekly coterie of enthusiasm. he asks for the red-lipped barbara’s dark hand & sees that her flaxen sister loves him more. rodenbach’s man finds a step ladder to observe the obscene ‘bell of lust’ circa. 1629, filled with its engraved green-lace of carnal-passions. van hulle an antiquarian & father of borluut’s new wife & her sister, can never synchronize his precious time-worn clocks. nothing’s perfect. …& our man borluut, champion of his newly renovated lace museum project, lost out of love & only to face the last words of the white-mantilla-shrouded van hulle: ‘they will chime!’ borluut sees the love for his wife dissipate. godelieve (his sister-in-law) replaces that with a new passioned life. while still maintaining a ferocious solitude in the belfry & with the bells. …& yet a spaniard as a spouse in rodenbach’s eyes, retains a fire of the inquisition burning in her heart, still branded with sadistic fury in the fog-dense town. joris borluut with an impossible-to-exit marriage pact, has his fidelity made even the more onerous around autumn’s ‘octave of the dead.’ he easily sees the wilting northern clouds overshadow the doomed dalliance. the sickened wife implodes & charges with madness at the discovery of it all, leaving the sister/lover to retreat to a obscure béguinage. borluut fights along with an artist bartholomeus against the dim city planners & loses to keep his town as-it-is (as-it-was): ‘the queen of death.’ everything continues to fall apart. openly reviled at his broken home & on the lost streets, he agonizes for the crisp quietude & false peace of the unearthly belfry, bells pealing or not. …& joris borluut hastened the end, he brought it all down in the ‘bell of lust.’ the bell carried his soul—in silence—there in bruges. 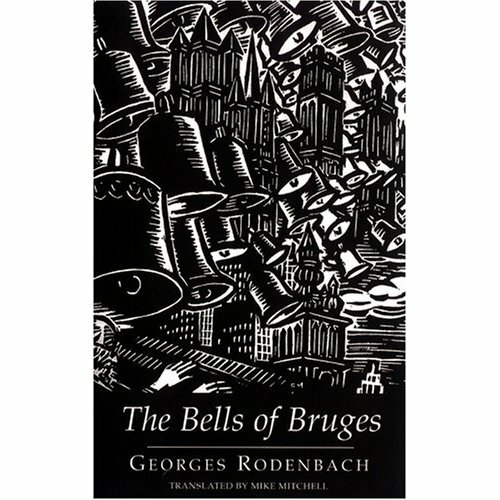 *The Bells of Bruges (Le Carillonneur, 1897) Georges Rodenbach, trans. Mike Mitchell, U.K., Dedalus, 2007, p. 243.